Did you know that the basic unit block was developed by an early childhood educator in 1913? The blocks' shapes and sizes were carefully chosen to work together and to further the idea that every young child can learn scientific, artistic, and natural principles through play. "In fact, multiple studies over several decades back up these claims, with some finding that children who play with blocks significantly outperform those who do not, not just in infancy but over their entire academic careers." -The Economist. The Amazon reviews on these give them 5 stars and I have to say I have not been disappointed. My kids have enough blocks to build the structures they want and there is a good variety of shapes. My favorite thing about this set may be the storage case which can double as a base for building on and keeps the blocks orderly when they are not being played with. 1. Magna-Tiles- these are a serious favorite around here and every parent I have ever talked to who owns these agrees that you will get your money out of these in play time. 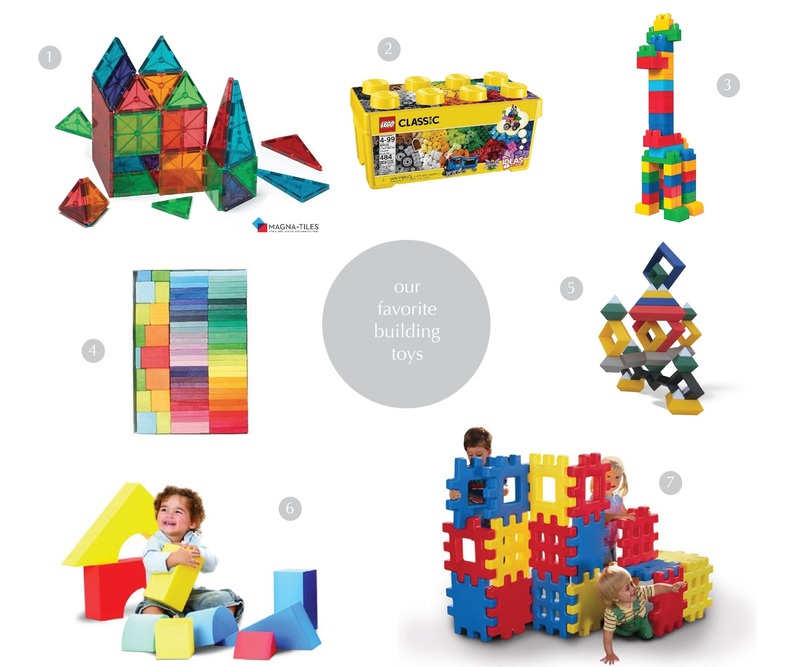 Kids love the rainbow colors as well as the ability to easily build vertical structures. In addition to easy vertical building these offer the possibility for rainbow roads for cars to drive on, a village of triangle houses, teepees, pattern play etc. The possibilities here are really endless and I am always surprised by what my kids build with these on their own (cathedrals, grocery stores, parking garages). My 7 year old and 2.5 year old both want to play with these each day. We recommend starting with the 100 piece set as you have the most building options, and then expanding from there. 2. Legos- I am a big fan of the Classic Legos for my kids because they offer open ended options. While I think a lot of the Lego sets looks really amazing, my kids are young and haven't reached the age where they will keep all the pieces together. I also like the process of creation that happens when you give them pieces without any set plan for them. The Duplo sets are fabulous for younger children. They offer the same open ended play, are easy to build with, and don't present a safety hazard. And there are so many sets to choose from based on your child's interests. 3. MegaBloks- For the younger set (1-3 yrs) MegaBloks are always a hit. Whenever these are around, the toddlers seem to make a beeline for them. They are big enough for them to handle well and once they learn to stack and connect them the option for making more than tower creations is there. While this set doesn't offer the longevity of the others, the price point is hard to beat. 4. 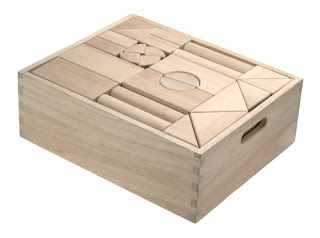 Grimm's Blocks- Grimm's blocks are possibly the most beautiful wooden blocks ever. When we got our Grimm's Color Chart set I thought I might be the only one who was excited about the colors, but my kids were equally excited and couldn't wait to break them open. The options for the Color Chart set are really fun since your typical block set does not come with these block sizes. You can do block dominos, build towers using post and lintel construction, use them as fences, or roads and bonus they combine well with the basic unit blocks. We have our eyes on the Romanesque set next. 5. WEDGits- WEDGits are marketed as an educational toy designed to encourage creativity, stimulate spatial thinking, and teach geometric patterning. I can't argue. These blocks are an entirely unique building experience and have challenged my children to think differently about how to balance, connect, and create. Going well beyond basic building, children stack, nest, and wedge the pieces together. I recommend starting with the 35 piece Deluxe Toy Set, that's probably the minimum number of pieces you need to have to really get utility out of the set. There are several ways to expand the set; buying smaller sets of 15 pieces, expansion combo packs, ImagAbility sets that are compatible with the base sets. Two comments to consider, the set itself may be smaller than you imagine and does include some smaller pieces- a little larger than dice. This set is best for children aged 3+. 6. Giant Soft Blocks- This toy set hasn't left my playroom since my oldest child was born. The blocks are colorful, soft, washable, and easy to create with. Each of my children started playing with them when they were between 6-9 months old and haven't stopped. Older children that come over to play often gravitate towards the bucket we keep them in and start building tall towers or pathways across the carpet. My son loves to build cities or ramps to race his cars around in. The blocks are sturdy and well built so they balance well and build into tall towers quite easily. They aren't the smallest toy, but they're not the largest either and can be tucked away in a corner or a few smaller bins without too much trouble. 7. Little Tikes Big Waffle Blocks- These blocks are so cool. I loved them as a kid and it's fun to see the children in my family love them just as much a generation later. If you have the space to easily accommodate, I highly recommend them. They are large and strong enough for children to build everything from chairs to sit in, cars to push around, and houses (with doors and windows and roof) to play in. The manufacturer says that the blocks are for children aged 2+ but children aged 4+ would get the most utility. Each set is 18 pieces. There's a lot you can do with 18 pieces but two sets would probably be optimal if you have a home with a lot of playdates. Have we missed any of your favorites? Let us know in the comments!